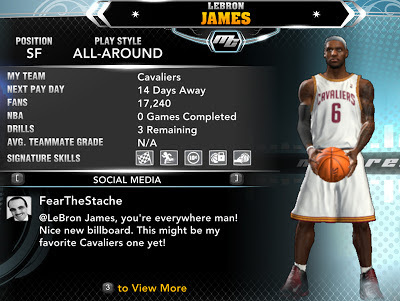 Description: Using this save file (.CMG) allows you to play as LeBron James in NBA 2K13's MyCAREER mode. Player Status: Drafted by Cleveland Cavaliers. Note: To fix the legs color, go to Menu > MyPlayer > Edit MyPlayer and select the option #2 skin tone to match the skin color of LeBron James. Installation: Copy the save file in your NBA 2K13 Saves folder and load it from the game menu.